Who was Georges Seurat? While this name doesn’t ring a bell to majority of readers, he made a tremendous impact on hundreds of painters, including Claude Monet and Vincent van Gogh, who authored several of the most expensive paintings ever. Seurat himself made only seven monumental paintings, what is understandable by his short career (he died at only 31 years), but among them are also few masterpieces. His Sunday Afternoon on the Island of La Grande Jatte was definitely a painting of a decade and is still sparks imagination of artists all over the world. 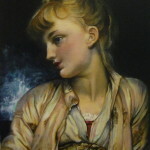 Second half of 19th century was groundbreaking era in art. New technologies finally gave masses a chance to access true art pieces. With development of chemistry, artists, on the other hand, got new materials on daily basis, what opened whole new world of opportunities for experimenting with different techniques. At the same time scientists tried to explain just about everything with mathematical formulas. For some time it looked everything will become explainable, including the feelings of people who are exposed to art. This is where Georges Seurat comes into the picture. Georges Seurat was born in relatively rich family and got artistic education from some of the best artists of his time from early years. 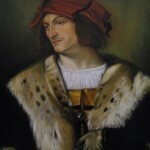 At nineteen years he moved from local art school to prestigious Ecole des Beaux-Arts in Paris, which proved to be slightly too rigid for his creative creative mind, so after a break cause by military service he decided to continue studying on his own. Deeply moved by ideas of Impressionism he decided to focus his painting especially on light, contrasts and effect of composition on the observer. He was particularly interested in color theory as presented in works by Michel-Eugene Chevrol and Humbert de Superville. The main idea was simple, yet revolutionary. Scientists demonstrated how human eye perceives a color not only from color in the center of attention but also from colors in surroundings. This drastically improved work of restaurators who became better at restoring the paint in damaged areas when they started to take into account broader areas of old paintings, tapestries etc. Seurat tried to exploit the fact how human eye blends a color from colors which were neighboring on each other. This means, for instance, the painter didn’t need to mix a purple, because the same effect could be achieved from tiny red and blue dots. 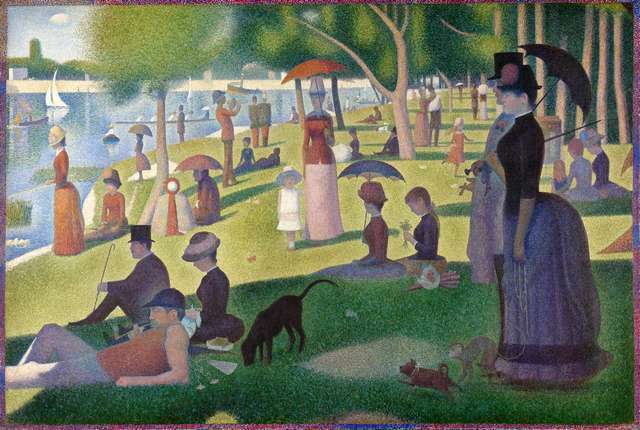 Even more, Seurat believed thus kind of purple, made only in beholder’s mind, should be more energetic and vibrant than any kind of purple, made from purple pigment or mixed from blue and red on the palette. While science later proved this is not true, Seurat’s paintings, made from tiny dots, possessed very special charm, where some kind of additional light was probably achieved by tiny empty spots of white canvas between the dots. His technique was called Pointilism (from dots) or even more accurately Divisionism (by usage of different colors, from which the desired color would be perceived). Himself called his work Chromoluminarism. Georges Seurat made his masterpiece when he as only 26 years old. The painting which is impressive by its dimensions too (more than two by three meters or 80 by 120 inches) took him two years to finish. He made hundreds of sketches, drawings, details and studies before he even started to paint. When the work was finished and exhibited (among Impressionists, but quickly marked as Neo-Impressionism), it became the central work of the exhibition. 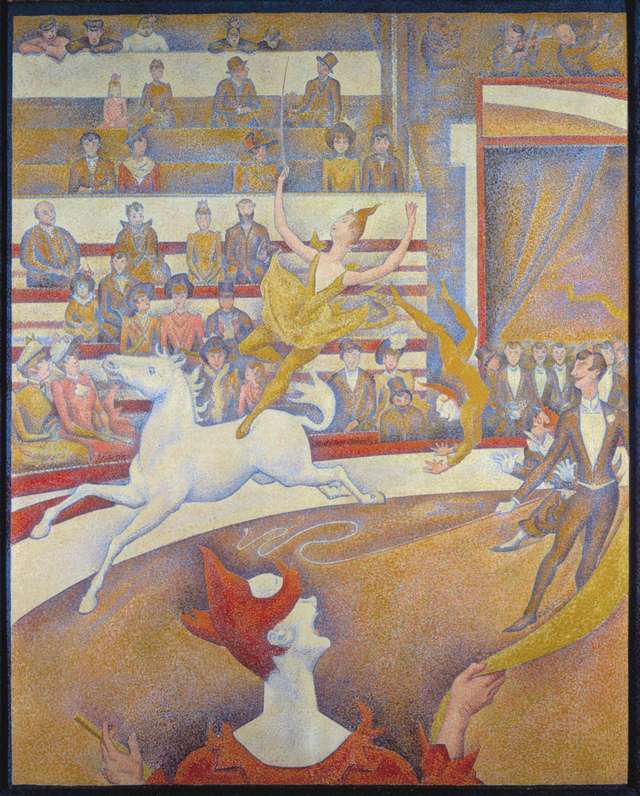 Many critics hated it, but Afternoon immediately established Seurat as the leading figure of Avant Garde in his times. 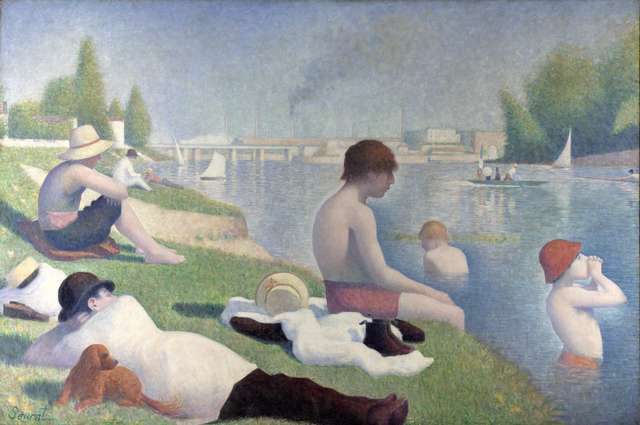 This work can be better understood in context with its predecessor (Bathers at Asnieres). While Bathers are full of light, Afternoon is extremely abundant in shadows. Relaxed scenes at Bathers are in contrast with somehow mechanical Sunday Afternoon, which led to numerous and sometimes pretty controversial interpretations. 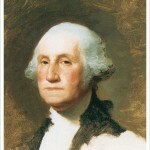 Some interesting and unusual details on the painting helped to fire up debates even more. The technical execution of the painting is a story of its own. Seurat used very different pigments to paint it and some were so new nobody knew how will they look after some oxidation will occur. Certain colors drastically changed even in a (short) lifetime of the artist. Seurat was not completely satisfied with the work at first presentation, so he re-stretched the canvass later and made a frame of dots in three colors, which supposed to be surrounded by completely white wooden frame (as it is today, exhibited in Art Institute of Chicago). In next years Seurat, who stayed modest and reserved to the end of his life, tried to find more scientific explanations of different visual effects. He gained interest in posters and caricatures and also actively participated in Anarcho Socialistic movement, which is closely related with Neo-Impressionism. His artistic (moving to Art Nouveau) and political ways slightly resemble the development and believes of his British contemporary Walter Crane. To keep the focus on creation, Seurat moved from Montmartre to the studio in more discreet location, where he also started living with young model Madeleine Knobloch who son became pregnant and gave birth to their first son. Georges Seurat introduced his young family to his parents only shortly before his unexpected death. It’s not known what truly happened, but it seems he contracted some sort of complicated infection which not only killed him, but his son too. Tragedy of his life didn’t end here, because Madeleine was at the time of Georges’ death already pregnant for the second time and their second son died soon after birth too. Seurat’s legacy, however, is still very much alive. He not only inspired some of the greatest artists ever, but his ideas also ignited whole movements like Fauvism (with Henry Matisse) and Cubism (with Pablo Picasso).